When the alarm goes off, many people hit the snooze button. But eventually they get up and go to work or school. Most plants, too, have an alarm clock. In fact, one of several such clocks goes off every morning. Circadian—or biological—clocks have a 24-hour cycle and "wake up" the processes that make plants operate properly. According to Autar Mattoo, a plant physiologist in ARS' Vegetable Laboratory in Beltsville, Maryland, the clock is located in the nuclei of plant cells. The clock controls an enzyme that modifies a protein, D1, which is critical to photosynthesis. Mattoo explains that every morning, D1 binds phosphorus. This process peaks before noon, providing a plant with a biotiming signal that tells it to adjust its metabolism to face the onset of the day's brightest light. This adjustment likely helps plants fare better when faced with the highest light intensities, which hinder photosynthesis. The experiments were conducted at different times of the year and in different climates, and the theory almost always proved true. (See "Cool Nightlife Bad for Tomatoes," Agricultural Research, October 1996, p. 15, for more information on how cold temperature affects circadian clocks.) Mattoo points out that the one thing that can block the accumulation of phosphorus on D1 is the concentration of triazine and urea-type herbicides, such as atrazine and diuron. D1 is also a target of ultraviolet-B (UV-B) radiation damage to plants. The plants cope with this by putting on a "sunscreen," which is made up of a set of phenolic compounds that protect plants from low doses of UV-B. At higher doses of UV-B, this photoprotection could be compromised. "It is therefore very crucial for every plant cell to keep time to protect itself and perform correctly, and it does this by a biotiming mechanism," Mattoo says. Mattoo worked on this project with researchers and students from the United States and in collaboration with Marvin Edelman of the Weizmann Institute in Israel. As a result of their 22 years of collaborative research, these scientists were the first to determine the whole life cycle of the D1 protein. Scientists have reported several other plant circadian clocks. Humans also have circadian clocks. Mattoo uses the example that some people are day people and some people are night people. Jet lag is an example of a person's biological clock being out of synch with the actual time. Mattoo's research appeared in the December 2002 issue of Plant Physiology.—By David Elstein, Agricultural Research Service Information Staff. This research is part of Plant Biological and Molecular Processes, an ARS National Program (#302) described on the World Wide Web at www.nps.ars.usda.gov. 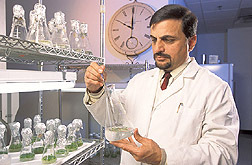 Autar K. Mattoo is with the USDA-ARS Vegetable Laboratory, 10300 Baltimore Ave., Bldg. 010-A, Beltsville, MD 20705-2350; phone (301) 504-7380, fax (301) 504-5555. "Plants' Biological Clocks Help Them Prepare for the Day" was published in the April 2003 issue of Agricultural Research magazine.